I just spent a wonderful weekend at Chad Waterbury's Rings and Power seminar hosted by Steven & Kari of Envision Fitness. One main emphasis to the seminar was training on the gymnastics rings. Gymnastic rings offer several fantastic benefits for almost anyone who wants to look and feel like an athlete. Today the TRX (and other suspension trainer spin-offs) are very popular. (I'll discuss the pros and cons of suspension training in a future post). 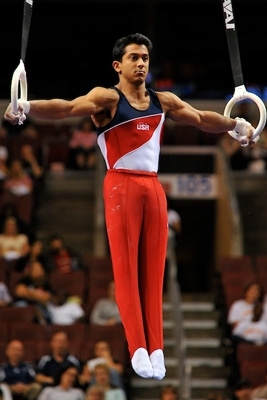 Chad pointed out that rings were the original suspension trainer. Functional muscle: a quick look at a male gymnast quickly reveals an incredible level of show and good muscle development. Few natural athletes have better upper body development than gymnasts. 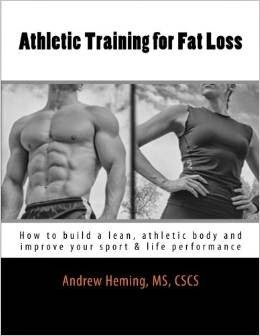 Maximal strength training: many popular body weight exercises (e.g. push-ups) and suspension trainers have you working with a certain percentage of body weight. As a result, most people can do many repetitions and this limits the benefits to muscular endurance. In contrast, most ring exercises use your entire body weight and positions can be adjusted to make things challenging - even for very strong individuals. This makes it possible to do intense, lower rep work and short duration (<10sec) holds that are fantastic for building strength! Enhanced motor unit recruitment: A motor unit is a group of muscle fibers and the motor neuron that connects to them. Body weight exercises tend to increase motor unit recruitment more than other forms of traditional exercises (e.g. free weights and especially machines). Good different: rings are fun and will spark new progress. However, unlike some "revolutionary" new fitness products, rings are tried & true a way of doing something that people don't normally do that is different and effective! Variety: you can do many different exercises on the rings. Chest, shoulders, lats, upper back, triceps, biceps, core stability, core strength, shoulder stability, shoulder mobility and more can be effectively trained on the rings. Progressions: the great thing with this seminar is that Chad showed how to peel back the exercises from what you see on TV. With proper know-how, ring exercises can be regressed for individuals of lower strength levels and progressed back up from there. Shoulder mobility with stability: we need our shoulders for a lot of daily life and sport activities. For optimal health and injury prevention, we need mobility, but we need with with stability. Ring exercises like Skin the Cat (sorry animal lovers, I didn't come up with that name) and full range of motion dips offer opportunities to build these two components together. Chad pointed out that building strength with mobility helps to reinforce the mobility. Joint friendly: I had experienced this before and it was confirmed again at the seminar. Saturday we pushed ourselves to the max with intense ring training. While the muscles got a great workout, I was amazed at how good my joints felt! If you have several years of training under your belt and joints that seem to protest certain barbell exercises, then ring training may be just what your joints would appreciate (note: if you have a specific problem, get it taken care of first and get clearance from an appropriate health care professional before you start swinging from the rings!). One of the reasons that rings are so joint friendly is that they allow the body to move the way it wants to instead of locking it into a fixed position with a barbell or machine. In our seminar, every single person had a slightly different pattern with their hands when we did ring pull-ups. Quick adaptation: Chad explained that the nervous system responds very quickly to ring training. As a result, you improve quickly. Who doesn't like that? Here is a sample video of what the seminar was like. If you are interested in learning more about rings and other suspension training exercises, check out my live workshop on TRX and suspension training. You can learn more about details for this workshop as well as other courses and workshops I run at my Upcoming Courses & Workshops Page. Thanks for posting that link. I agree that is one of the best ring performances I have ever seen! Very inspiring!